Getting a good college alarm clock is one of those dorm essentials that every student needs to get. No longer will Mom and Dad be able to shake you when you oversleep! Getting up on your own and never missing class will require discipline and a quality college alarm clock. Our cheap dorm alarm clocks have the quality and features necessary to ensure you wake up, go to class and succeed. 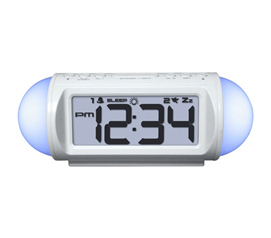 Our dorm alarm clocks range from the fun and unique Clocky to vibrating alarm clocks and basic cheap alarm clocks that get the job done. Good luck at college and we hope you enjoy our dorm stuff! Nothing is more important than getting to class! And at DormCo we know it all starts by having the right dorm room alarm clock. All the great college dorm bedding and college supplies won't matter if you can't get yourself up and off to class. 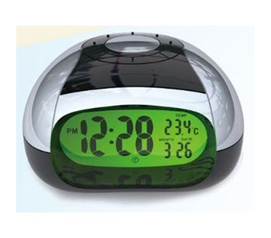 Also some of the coolest dorm stuff created for college are the various alarm clocks DormCo has. From Clocky to the Flying Alarm Clock, these clocks are not only unique, but they'll get you to class, which is what college should be all about.